The Calistoga Art Center offers classes to nurture your creativity. Beginners and professionals learn together in a relaxed, fun-filled atmosphere. Classes and workshops are small enough to receive a lot of individual attention. Scroll down to see all classes. Note there is a separate web page for Printmaking. Please register/pay in advance! We don't want to have to cancel classes. Do you want to get back to painting or learn how to paint for the first time? Or do you want to explore how to paint from a different perspective and acquire new skills? Karen teaches people how to tap into their creativity, tame the inner critic and make better paintings. Have you been waiting to try your hand at creating clay? Would you like to push your current clay skills to a new level? This class is geared towards all skill levels. In this open format class students of all skill levels will have the opportunity to work on individual projects. Instructor Bloomer will address all student needs as they arise. Demonstrations in hand-building, throwing, glazing at introductory and advanced levels will be given throughout the month as requested. 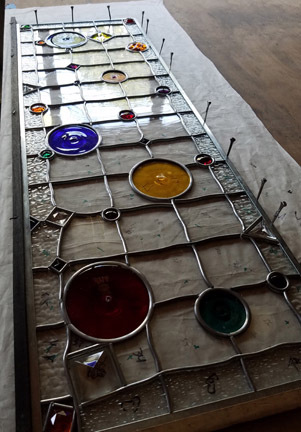 Come explore the exciting techniques of creating stained glass pieces using copper foil and traditional lead came. Lisa has been involved with glass work since 1986. The journey began with taking classes through the Napa Jr.College under the tutelage of Jerry Sinclair and then in 1987 on to Great Panes in Calistoga working for Raymond Centanni and still working there for the last 32 years. Great Panes has done projects locally and all over the world. Advance enrollment is appreciated, if possible.